The Aston Martin Short Chassis Volante is one of the rarest factory-built Aston Martins of all time. It’s rarer than the ultra-exclusive One-77 supercar. It’s a mix of DB5 and DB6 and the first Aston to carry the now-legendary moniker “Volante” (which is Italian for “flying” and has adorned just about every factory Aston convertible since). How this car came about was that in 1965, Aston Martin introduced the DB6 to replace the DB5. But they still had 37 DB5 chassis sitting around. So they built a run of convertibles using the DB5 chassis and engine with DB6 touches (some front panels and lights) and interior. The term “Volante” was applied to differentiate it from the DB5 convertibles. The engine was the DB5 carryover: a 282 horsepower 4.2-liter straight six. They were also very expensive. This car was bought new in London where it remained for about five years until it found its way to South Africa where it disappeared until about 2000, when it was rescued and sent to California for a restoration. It has covered about 2,200 miles since and is in excellent shape. These cars don’t come up for sale often (as there were only 37 built), however, RM had one at a sale last year that failed to sell at a final bid around $900,000. This should bring a little more. You can click here to read more and here for more from this sale. 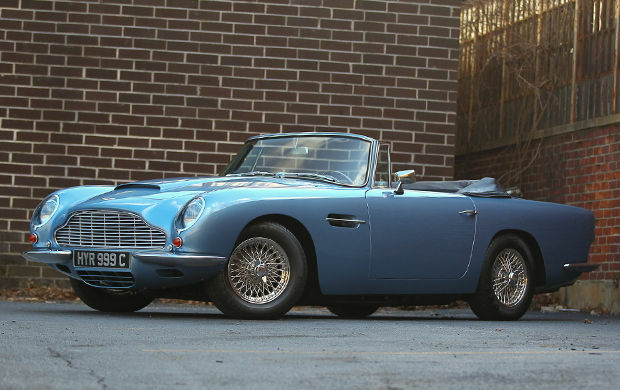 This entry was posted in Uncategorized and tagged 1965, aston martin, auctions, cars, classic cars, gooding & co, short chassis volante, volante by classiccarweekly. Bookmark the permalink.